The year started with a return visit to the Lancashire Record Office in Preston on the 28th January – members having first visited for a presentation in early 2003. The Annual General Meeting in February was attended by 36 members and three guests. The proceedings were dealt with in the usual efficient way by the Chairman, who concluded the meeting in just 25 minutes. During the meeting the Treasurer presented the accounts for the year which showed a surplus of £385 and reserves of £1,802. The rest of the meeting was taken up by our popular ‘Dip into the archives’ feature. Twenty five members turned up at Clayton Green Library for the March meeting, to learn about using the Internet for research purposes. However, gremlins got into the works as the Library’s system crashed leaving a very embarrassed and apologetic Librarian. The Secretary quickly adopted a ‘Plan B’, giving an illustrated talk about the Gallipoli campaign in 1915 and local men’s involvement. The April meeting saw 78 people attend a talk by the Secretary, entitled ‘Blackburn Rovers in the Bryan Douglas era’, all about the well known player who played for ‘Rovers from 1950 to 1969. After the talk, the Secretary was joined by Bryan Douglas who related quite a few stories about his playing career and also answered questions from the audience. Guest speaker Rebecca Whyte (daughter of the Chairman) gave a very entertaining talk at the May meeting. She spoke about “Making a living in Brindle & Chorley – people and their occupations in the 18th century”, giving some fascinating facts and figures about Brindle residents, ‘then and now’. The planned Treasure Hunt in June was cancelled due to lack of numbers but the coach trip on Sunday, 6th July went ahead. Some thirty people enjoyed a full day’s excursion to South Lakes area, organised by the Chairman Ian Whyte. There were visits to Holker Hall (it being owned by the Cavendish family, related to the Brindle Estate), Cartmel Priory (again with Cavendish and Brindle connections) and the day ended with a walk around Furness Abbey near Barrow-in-Furness. The Chairman provided a very enlightening talk in September, presenting ‘What’s in a name? – place names in Brindle & District’. The October meeting attracted quite a number of non-members to hear a talk about early steam railways. 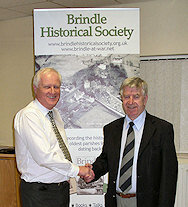 Accrington based historian, Frank Watson presented a talk about ‘The East Lancashire Railway, 1846 to 1859’. The last meeting of the year was in November. The Secretary presented a talk about ‘Brindle Pubs’ – many were surprised to learn that there had been six pubs in the village over the years (just one now remains). 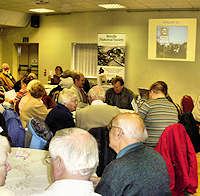 In October, we hosted the Lancashire Local History Federation ‘At Home’ event which attracted 85 people, from across the county, to Brindle Community Hall for an all day event about the history of Brindle. Delegates were told about the Village Hall (1923 – 2008) and the conservation area; they visited the Parish Church (1190 – 2008) and after lunch found out about Brindle Races (steeplechases around the village prior to WW1) and the diverse military history of the village. The day ended with a presentation about our archives, books and websites. Thanks go to all who attended and helped with the event, and to Lancashire County Council (via Cllr. Margaret Livesey) for sponsoring the day. The long awaited book about the men from Brindle and Hoghton who fought in the First World War was published on Remembrance Day; by the end of the year it had sold over 230 copies with Lancashire Library Service taking 20. During the year the Society did two ‘outreach’ events. In April, an open day at Brindle St. Joseph’s School about Brindle Mill & Bournes Row attracted 125 visitors and a display and book stall at Hoghton Village Hall in November attracted some interest. The Archivist, Darren Cranshaw, gave a talk about the Brindle Estate to Chorley Historical Society whilst the Secretary visited two local Primary schools, giving presentations to the children on local history and Remembrance respectively. As the year came to a close, the Society recorded presentations to Tony Harkness for 25 years service as Clerk to the Parish Council and a similar presentation to Meg Burford upon her retirement after six years as Chairman of Brindle Community Hall. The archive was swelled by many photographs, including those taken of the fire at Brindle Mill in the early 1970s. Membership for 2008 was 66 – an increase of 10% over the previous year.